To testify before Congress, you don’t actually have to be in the room. That’s the case for NASA astronauts aboard the International Space Station, who have occasionally beamed into congressional hearings via satellite. 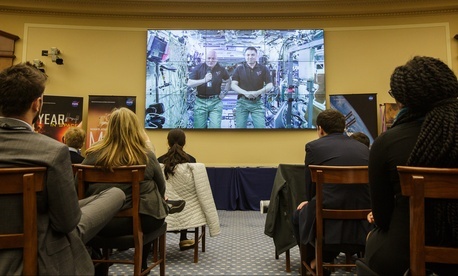 Kelly and Lindgren, appearing on a large screen in a Rayburn hearing room, bobbed up and down, their arms crossed or planted on their hips or in pockets to keep them from floating upward in the zero-gravity environment. Representative Donna Edwards, a Democrat from Maryland, asked Kelly and Lindgren about the vegetables they’re growing aboard the orbital station, which include lettuce, Swiss chard, radishes, and Chinese cabbage. The ability to produce food thousands of miles from Earth is crucial for longer space missions—like one to Mars, which Kelly said he believes is possible by 2033. But for now, it’s mostly a comfort, said Kelly, for astronauts who can’t experience nature on the ISS. “We live in an environment that’s pretty much devoid of life, except for us,” he said. Representative Don Beyer, a Democrat from Virginia, asked about the astronauts’ relationship with their Russian colleagues, given strained relations between the U.S. and Russia on the Assad government, the Islamic State, the Ukraine conflict, Edward Snowden—the list goes on. The orbital station, a half American, half Russian operation, has remained largely untouched by terrestrial politics over the years. Three cosmonauts are currently living on the ISS. Last week, President Obama signed into the law a bill introduced by the House Science, Space, and Technology Committee. The legislation, called the U.S. Commercial Space Launch Competitiveness Act, encourages private-sector companies to conduct rocket launches and space exploration. It would allow businesses to own and sell resources they might mine on asteroids, an idea that has divided space policy wonks. The bill also reiterated the need to keep the ISS in orbit until at least 2024, a year set by the White House’s latest extension this past January. It costs about $350,000 an hour to keep the station flying.